VTS can customise and fabricate tailor made signage to suit your specific requirements; any design, colour and size. Our signage places your business in front of hundres of thousands of people every day and night, making it the best advertising for you and taking your company to great heights. VTS strives on health and safety ensuring that all signage is engineering to meet strict guidelines within the industry. 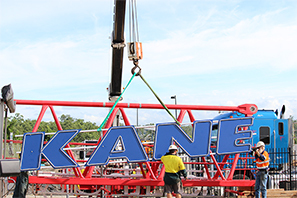 Just as we can customise our cranes to suit your project, we can also create tailor-made crane signage to match your specific requirements. Any design, any colour and any size – our signage design is made to meet your needs. Plus, all our signs are wet weather-proof, manufactured using lightweight material and feature high-tech lighting in a variety of colours. 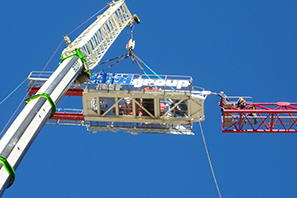 And because we’re focused on site safety, all crane signage is engineered to meet strict crane structure requirements. 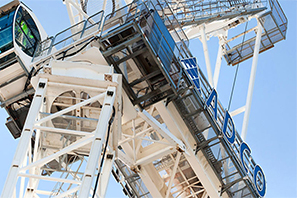 When you work with VTS, you’re partnering with the leading provider of specialist state-of-the-art lifting equipment and labour for Australia’s biggest and most diverse construction projects.